Registration for this webinar is now closed. But stay tuned! Links to listen to and view the webinar will be available in the upcoming month. Below is information regarding the content of the past webinar segments. 'A series of lectures will be presented on the concepts in the ANR publication, “A Planner’s Guide for Oak Woodlands” (UC ANR Publication 3491). The goal will be to create an awareness of the ecological, economic and social values of California’s oak woodlands, and some general planning strategies to ensure long-term conservation of this resource. The selected audience includes city, county, regional and statewide planners, environmental consultants, conservation organizations, land trusts, resource professionals, elected officials, and NGO’s. Session 5 includes an optional field trip to the Hopland Research and Extension Center on April 21, 2012 and to the Sierra Foothill Research and Extension Center on May 5, 2012 from 10 am to 3 pm. 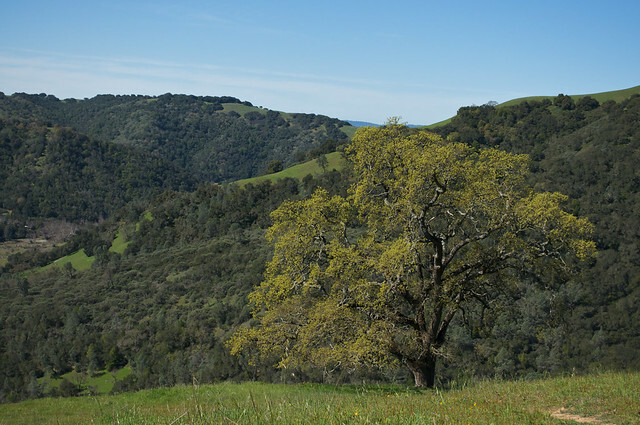 The trip will discuss oak planting projects, landscape considerations, mitigation approaches, and addressing ecological functionality through the planning process. "A Planner's Guide to Oak Woodlands:"